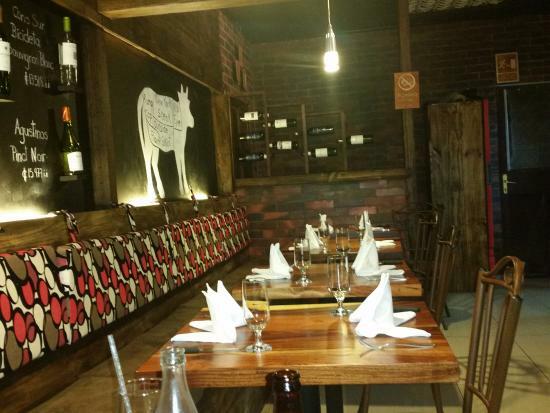 Toro Tinto is a beautiful, small restaurant based in Santa Elena. The spot offers excellent lunch and dinner at reasonable prices. Often visited by Australians, Germans, and Swiss, the spot is then crowded. So, you need to make a reservation when you plan on going to this place. You can go with your partner, family, and friends. Whether you have cash or credit card, you are welcome. The menu comprises of steaks, fries, chicken sandwiches, veggies, wine, chocolate, tenderloin, ribeye, fish, and much more. Thanks to the cook, all the foods are excellently cooked. To whet your appetite, you can ask for salad with chimcurri, a great flavorful combination. 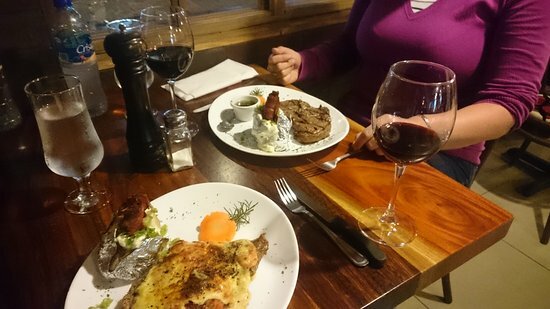 The steak should not be missed; it comes with ribeye, two delicious dishes blended together. If you love seafood, the fish is the way to go. Then, you can grab the tenderloin with chicken. As for beverages, you can request for sangria, a red wine that’s flavored with nicely chopped apples. It’s the best wine at the restaurant. Then, you can end your meal with chocolate, such an unbeatable dessert. The staff is welcoming, hospitable, and attentive. They welcome all the clients and seat them in no time. Even though the seats are near the kitchen, the clients are not hot as there is a wall in between them. This nearness to the kitchen gives the clients the privilege of watching the cook perform magic in the kitchen. Although the staff speaks only Spanish, they try all their best to serve the clients the best way possible. For example, upon providing the clients with the menu, they also help them choose the right food in accordance with their palate. Then, the food comes in a timely manner. 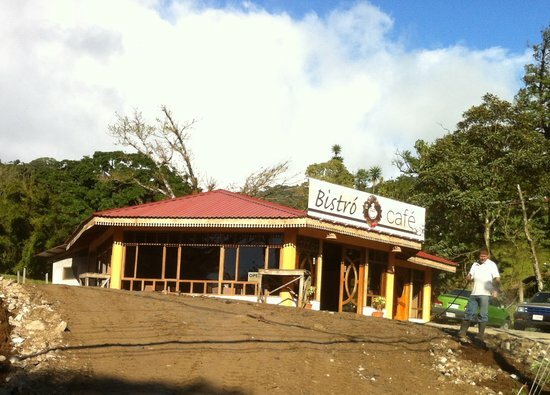 Situated in Santa Elena, Bistro Bon Appetit provides clients with excellent foods and services. The meals are suitable for both adventurers and locals. After touring Costa Rica, the travelers find the spot a must-stop as the dishes are so refreshing and tasty. The restaurant has an extensive menu. It offers mouth-watering foods such as garlic prawn pizza, spaghetti bolognese, rice, chicken wrap, fries, salads, pasta, and much more. The food is dished up generously, so that you can get stuffed just with one order. However, you can still try some other dishes if you like. 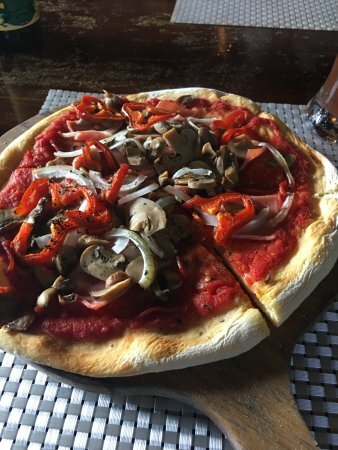 The pizza is very delicious; it will have your mouth water whenever you remember enjoying it. Aside from flavorful dishes, the restaurant offers delicious juices; you should not miss the natural mango juice. It is fresh and tasty. Yet, if you like beer, you can have plenty of options; you can either ask for Bavaria dark or IPA (it has great selections). The staff is both welcoming and friendly. As the clients get to the restaurant, they are warmly welcomed and given great samples of food. When they decide on the food, the staff takes their orders; they bring the food to the tables in a timely manner. As a result, the customers don’t wait long hours to get their food. Furthermore, the staff has plenty of food, which can be used to substitute for other dishes, could the clients ever seek the replacement of their meals. Interestingly, apart from speaking Spanish, the staff is also able to speak English. This makes the clients even more satisfied with their orders. Beso Espresso is a cafe plus boutique coffee roaster. Situating at the end of the road this coffee bar draws everyone’s attention. This shop is trying to establish a concept called “specializing in coffee.” If you are looking for a coffee shop to taste some genuine coffee, this is the place for you. Beso Espresso collects coffee beans from all around the country. All the best farms of the country provide beans to them. They are so knowledgeable about the coffees that they will tell you in which region of the country your coffee was harvested. All the coffees are prepared wisely. Latte, mocha and espresso has different flavors. Cappuccino are served with properly steamed milk. Almond milk and dairy free chocolates bring extra customers for this place. It is called that they serve the best coffees in Uvita. Exceptional aromas and smells of coffees will make you want more. They also have a small choice of home made pastries, brownies and cookies. They roast every week so that you get freshly roasted beans. It is a highly recommended cafe. Both tourists and local people’s favorite place to have coffee. The outside sitting porch gives the place a natural view. One can watch the bustle of town while having their delicious coffees and pastries. It’s a small cafe but don’t let the outlook move your decision to visit this place. Once you are there, you will be glad that you are there. The customer service is really great. The servers are very helpful and quick. They all know English. So you won’t face any hassle regarding language. The owner is always there taking care of everything. They also sell coffee bags. So it is a plus of course. They are open all seven days! Monday to Friday: 7 am to 7 pm. Saturday and Sunday: 11 am to 7 pm. Beso Espresso is located in a very convenient downtown location. It’s easy to reach there. The premises of the cafe is so perfectly designed that it will surely draw your attention.